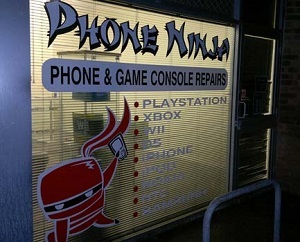 Phone Ninja is proud to be an integral part of the local community in Perth, WA. Our shop has been in business since 2009, and between our techs, we have almost 30 years of experience in handling all types of electronics repairs. Our store in Willetton is perfectly positioned South of the River just off the Freeway so its easy to access from anywhere whether you’re in Rossmoyne, Riverton, Fremantle, Canningvale, Maddington, Cannington, Bibra Lake, Spearwood, Kwinana, Rockingham, Mandurah or in any of Perth’s southern suburbs. If you are in the Northern suburbs of Perth then see our Osborne Park store, or for Eastern suburbs see our Belmont store. We’re committed to ensuring our customers have access to the highest quality, most professional Mobile Phone, Tablet & PC repair service, from glass replacement to full glass, touch and LED replacement, software fixes, battery swaps and more. We offer an unbeatable price guarantee, and we’re also proud that most of our customers can be served on the spot, often in an hour or less. If you need phone repair for your Apple, Samsung, Motorola, LG or other phone, contact us today at or come down to the shop to speak with us in person. Our store manager, Damian, has been a part of the Phone Ninja family for a long time. He’s always happy to help customers with any problems, and can be counted on to be happy and even bubbly, making your experience at our store that much more enjoyable. In his off time, Damian enjoys making music, enjoys having model-like hands as seen in our YouTube tutorials, and has a habit of making bad jokes (you’ve been warned). Our shop is located South of the River Perth and is conveniently 2 minutes away from the freeway. Willetton is near suburbs like Riverton, Cannington, Rossmoyne, & Canningvale. Continue along Leach HWY until turning right at High RD. Walk down High Rd away from Bunnings to Yampi Way . Look for Repco it’s on the Yampi Way / High Rd Corner. Once on Yampi Way our store is on the left hand side just past Sigma Pool Supplies on the intersection of Kembla & Yampi.